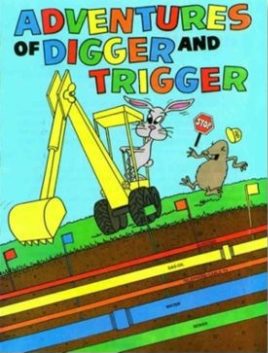 Digger the Mole and Trigger the Hare star in our coloring book that teaches children not to pull up utility marking flags at dig sites. They also teach readers of all ages about how utilities are located and marked and the importance of utility locating in protecting excavators and the public. There is space on the back cover to print your one-call information or any other safety message. Shipping is calculated after the order is placed. Ask us about quantity discounts on orders over 2,000. Call 815-468-7814.